Jack Caldwell's Austen-verse novels have been a pleasure to read over the last couple of years. Pemberley Ranch is a treat for any lover of Pride and Prejudice, but it's Caldwell's The Three Colonels that really stands out as a credit to not only his impressive grasp of history but his clear and apparent love for Austen's characters; and I'm happy to report that his latest novel, The Last Adventure of the Scarlet Pimpernel, continues in that vein and does not disappoint in the least. Looking at the title, you probably aren't expecting this book to live in the same world as The Three Colonels, but that's precisely where it belongs. If you're trying to figure out what Baroness Orczy's preening Pimpernel has to do with Austen's characters, let me remind you that, in The Three Colonels, Caldwell tweaked Jane Austen's timelines just enough to throw the characters into wartime - to just about 25 years after the Reign of Terror ended in France. Thus we find some (mostly) minor characters from Austen's Northanger Abbey, Pride and Prejudice, Sense and Sensibility and Mansfield Park thrown together with Percy, Marguerite and their children. The timeline is a clever trick on Caldwell's part, giving our author a twofold advantage - for one, by focusing on Austen's minor characters he's allowed more freedom in their actions and, secondly, by setting his novel into a generation after the League of the Scarlet Pimpernel's activities he can still use Orczy's main characters and not upset their thru-line. What results is a delightful and effective mash-up of the two styles; a drawing room romance and a heroic mannered melodrama. And, as in the other two Caldwell titles I've mentioned, he yet again shines a light in places Austen left practically unattended. In both Pemberley Ranch and The Three Colonels, Caroline Bingley became a character one could actually talk about; in the latter, Wickham became more developed and Lady Catherine turned out to be human. In this most recent novel, the focus (and, strange as it is to say, hero) is Frederick Tilney - Henry Tilney's profligate brother in Northanger Abbey, whom many consider to be a kind of pre-caricature of Mansfield Park's licentious Henry Crawford. In Caldwell's hands, Frederick - who becomes perhaps a more rehabilitated character than even Caldwell's version of Caroline Bingley - happens to be friends with both Colonel Buford (of The Three Colonels) and George Blakeney - son and heir of one, Percy Blakeney, tying all the relevant threads together and making for a beautifully elaborate, satisfying read. The characters walk from one source to the other, mixing with Caldwell's original characters so effortlessly that one can easily believe that they were all birthed from the same mind. The presence of the Blakeneys, their relationship with the Prince Regent, and the dichotomy of Percy's character heighten the social profile of the ensemble overall; the ton becomes almost a separate character - a barometer by which both Orczy's and Austen's characters at times measure their clout or worthiness. It's an effect that is present in the Pimpernel stories, but seeing it affect Austen's characters the way it does is rather new. Sure, we get a glimpse of it in Sense and Sensibility when Marianne shouts Willoughby's name across a crowded room, but this is on a grander scale. On top of which, the reader is juggling not only London but Paris as well - it wouldn't truly be a adventure for the Pimpernel if France were not involved, no? And what awaits these characters in France is a story all its own, with twists and turns worthy of both the ladies who inspired it. Truth be told, I finished this book some time ago, but it's taken me awhile just to wade through all of the feelings it brought to the surface for me - I don't know that I've been so affected by a book since Atonement, and I honestly don't know if that says more about Francisco Goldman, about the book, or about myself. As with Ian McEwan's Atonement, the narrator has an overwhelming amount of survivor's guilt, though Goldman's approach is significantly more transparent than McEwan's fictional narrator. I remember reading the New York Times review back in 2011 and feeling so compelled by Goldman's loss - his young wife died tragically only two years into their marriage in what authorities would call a freak accident - that I stopped into the Grand Central Posman Books (now gone) the next day to buy it. I couldn't remember the name of it (a fact which I acknowledge to be incredibly ironic) but I was able to summarize it (no response from the employees) and describe the cover - the guy helping me located the sea-blue hardcover with the shapelessly-draped wedding gown floating beneath the title, and looked at me kind of dubiously as if he either had no idea what I was about, or as if he was judging my choice of book. Perhaps that's in part because this tremendous story of tragedy doesn't make for a great best-seller, or even a highly-recommended mass market beach read (actually, in the interest of taste, please maybe don't read this at the beach). It feels so much more niche and complex than that - not something the casual reader would or should pick up. Honestly, I'm not sure I was at a point in my life in 2011 where I could have been prepared for it; now that I'm past 30 and have had my share of loss, I know that I appreciate it more than I could have then. It's a commitment - truly, I think any memoir or biography or autobiography worth its weight requires more attention than most readers can give, but then I hate to call this novel any of those; it is without question biographical - but the way that Goldman breaks up the tragic tale of his short-lived ardent love and builds it strategically is much more like a fictional novel and, in that aspect, exceeds even McEwan in sparking my emotions. Goldman has even said this is not a memoir - certainly, these events happened, but the telling is him emotionally...not the real him - he cites Faulker to this point: "A novel is a writer's secret self, a dark twin of a man" and so that is how he proceeded with telling his story but also removing himself to a degree and allowing the catharsis to take on a life almost of its own. By design (I imagine), their story arrives like waves as high tide approaches - you can see them in the distance as they surge and recede back and forth until the reader is completely saturated, drowning in stimuli. The Times reviewer called this oscillation "restless...the pacing of the grief-struck," which is terribly accurate in this case. shames himself for his humanity in a way that makes it clear that he is (or, was, at least at the time of writing) still working though his grief. We see the denial, the anger, the bargaining and the depression and it seems, only when he begins to imagine Aura as a spirit in her tree, that he has begun to approach acceptance. How can one explain death? How can one begin to understand it? And how can we move beyond it? 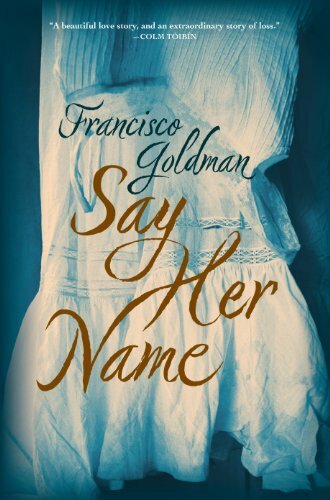 Perhaps we never do or - as Goldman says - perhaps grief is eternal like a person's name - "Say her name. It will always be her name. Not even death can steal it. Same alive as dead, always." While I can't recommend this book for most readers, I encourage you to read about Francisco and Aura - you can read about the Aura Estrada prize here, and you can read an excerpt "The Wave" here. When my grandmother passed a few years ago, I inherited some of her books (as the big reader in the family, almost by default). Among them was this one - a book that my mother had given her to read with the note you'll find at the bottom of this post. I honestly don't know why I put up with having so many biographies in my possession. I dislike them immensely. They rarely illustrate a full life, especially when it's the life of someone who lived so long ago; we are subject to what was left behind almost incidentally as opposed to recorded, on top of which the writer - who means to interpret and illustrate that life for the reader - often leaves off the least-appetizing bits and inflates the subject's importance. 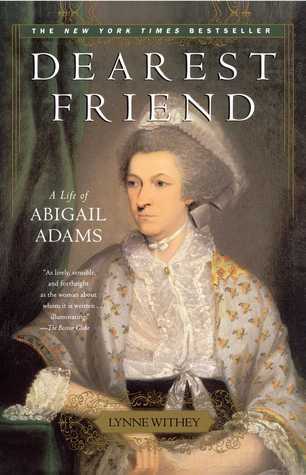 I don't deny Abigail Adams her influence. She was assuredly one of the most influential women in early American history, and she definitely suffered for it. But in Dearest Friend Lynn Withey really makes it feel as if Abigail was the only influential woman of the time, which is incorrect. And while Withey does not shy away from Abigail's personal faults, she does gloss them over by focusing so strongly on her loneliness, as if that were an excuse. And from this book, you cannot tell that Abigail and John had any real feeling for one another. The author describes letters between the two of them and often fills space by saying that John did not write often, but still insists that the feelings were strong. In 1981, when this book was first published, this might have been acceptable. In 2016, it doesn't pass muster. I would rather have just read their letters. Instead, it was just a lot of Abigail Adams feeling sorry for herself and trying to control everyone else. She decides to add rooms to her house, but we don't get an explanation of why. She agrees with her husband's politics (Federalist) until suddenly neither of them do, and then she starts agreeing with the Republicans - but so little is said about what was happening at the time and what could have influenced that change in her vision other than a mention of John Quincy explaining something that we never get the benefit of understanding; it reads more like an outline than a true-to-life story. It's an illustration that is neither complete nor appealing and, as a reader, it is a bit of an affront to my intelligence. she was the "first and only woman ever to be both wife and mother of American Presidents." In 2001, 20 years after this book was published and 200 years since John Adams vacated the Presidency, Barbara Bush became the second. Though I very much doubt that Mrs. Bush ever had to make as many sacrifices, or was ever called on to advise, as much as Abigail was. I also very much doubt that Barbara would ever be caught hanging her laundry in the east room of the White House.